Last weekend I got an invitation to visit Western Serbia. Although I’ve been there many times, I never miss a chance to come again. And I’m glad I went! This tour was a little bit different than the ones we are used to. We were accommodated in the 4* hotel Zepter in Bajina Basta. From Belgrade to Bajina Basta takes approx. 3.5h. If you’d rather stay in a small city instead of Tara Mountain, this is a great choice. We arrived in the late afternoon and then prepared for dinner in distillery BB Klekovaca, the most well-known distillery in the area. The food was delicious and the cocktails, made from rakia, were excellent. It was an excellent start to our trip! The real adventure started the next morning. Our first stop was Drvengrad, a magnificent ethno village constructed by famous Serbian director and filmmaker, Emir Kusturica. Don’t be surprised if you see Monika Belucci or Johnny Depp drinking coffee there. They are very good friends of Kusturica and very welcome guests. The village is a great choice if you want to take in nature from a wooden cottage and enjoy additional facilities like a swimming pool, cinema, and tennis courts. To get from Drvengrad to the train station Mokra Gora, we took a small countryside path, hidden from the eyes of the ordinary traveler. Train Nostalgia was waiting for us. It consists of reconstructed wagons, giving you the feeling that you are in a train museum. This year they are reopening the route from Mokra Gora to Visegrad in Bosnia — we were the first travelers to follow this route in many years. It was a beautiful ride, about 2h, with a break to visit a Bosnian monastery. It was a great feeling, passing the border and entering Bosnia on a historical train. We arrived in Visegrad, well known for its bridge on the Drina River, which was constructed in the 16th century. Famous Serbian writer Ivo Andric put it on the map when he wrote a historical novel The Bridge on Drina for which he won a Nobel prize. Emir Kusturica constructed a small city dedicated to Ivo Andric, called Andric city, so if you are in Visegrad, don’t miss it! And finally, the one thing I won’t leave Visegrad before having is a local sweet called Tufahije, made of apple and walnuts with cream on top. It’s an excellent choice for a refreshing dessert after a day of exploring. After a dynamic morning, we continued our trip. This time we went by boat down the Drina River. Excellent choice. The whole cruise we were able to take in breathtaking nature. Lunch was already prepared and band was providing a musical backdrop for added pleasure. There are no words that can describe the beauty of the surroundings, so you’ll have to take a look at the photos! We finished up the 3h cruise on Perucac Lake and went back to the hotel. 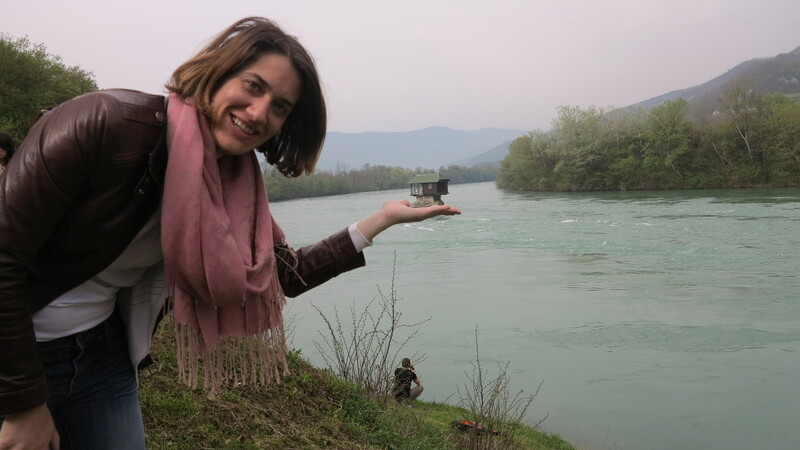 The next day, we visited a remarkable house that stands proudly on a small rock in the middle of the Drina River. Constructed by a few friends who wanted to enjoy the water during the hot summer days, this house became a symbol of the area. Monastery Rača was our second stop, the most important cultural heritage site in the area. It was constructed in the 13th century by Serbian King Dragutin, a member of the famous Serbian dynasty Nemanjic. Then it was time to move on to Banjska Stena. If you ask someone which is the most photographed viewpoint in Serbia, they will tell you Banjska Stena. I think that photos will tell you why! To finish our tour, we went to Waterfall Vrelo, next to which we had lunch. The sound of water is so peaceful and relaxing, it was the perfect ending to an excellent journey. If you want to go on an adventure, TET can take you to the hidden gems of Western Serbia.